2 small ripe plum tomatoes, slice diagonally across. Take the skin off the chorizo and quarter the sausage lengthways, and then slice across into small pieces. Put a non-stick sauté pan over a medium heat and cook the chorizo until the fat starts to ooze out. Lower the heat and add the oil, and then add the shallot, garlic, and sweet red pepper rings ( and the chopped chilli, if you are using it). Sweat these gently for about 5 minutes, until they have softened. Now add the tomato purée, the sweet chilli sauce and the water, mix well and cook gently for another 2 minutes. Add the prawns and cook for another couple of minutes until they are cooked through. Finally add the sliced tomato and mix in well. Set aside for a few minutes to cool. Heat a grill pan, drizzle some olive oil on the cut surface of the ciabatta, and toast the the cut side on the grill pan. 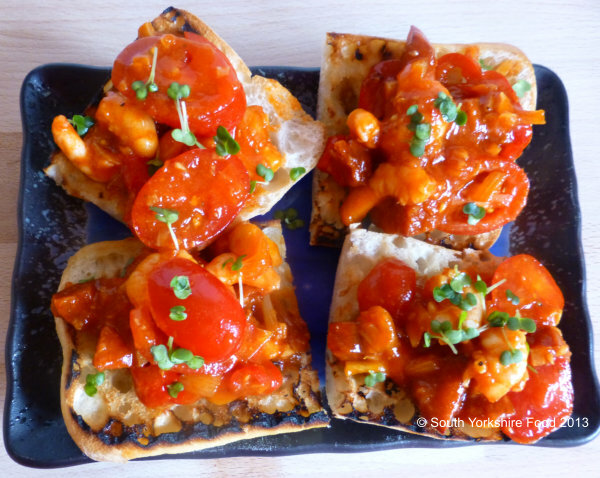 Spoon the chorizo and prawn mixture equally between the 4 ciabatta pieces, and garnish with chopped coriander or cress.